We took a grueling 6 hour boat ride from Siem Reap to Battambang. The motor spewed toxic fumes and vibrated our seats as we tried to get comfortable on an overcrowed boat. The noise and the smell of the motor were intense. We expected a scenic boat ride, and it was, but the trip was draining. The banks of the river were full of life. Fishermen pulled in nets around every bend in the river. I swear we only went 10 miles as the crow flies, but the boat struggled for 6 hours to get us up the long and winding river. Our wake would slosh the mucky water onto the banks. Fish were beached with every wave. This river was full of fish! Every net the fishermen pulled in had some fish in it. We often saw fish jumping out of the water. They were probably trying to escape the brown water for a second. 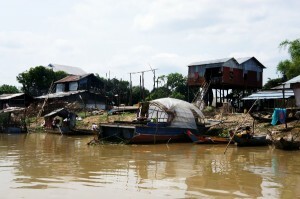 Brightly painted homes floated on the banks of the river. It was a sight to see. Everyone paddled up to their homes with groceries or to run thier daily errands. Our boat dropped a couple of people off at their homes along the way. It was a sort of Venice of the far east. We even saw a boat dock built by UNICEF. It’s is good to see aid agencies providing practical things for poor people. Its a shame we don’t see more of it. Almost paralleling our energy levels, the quality of homes started to digress as we headed up the river. You can see one of the traditional boats in the foreground. It is the red and blue boat with the white tarp roof. 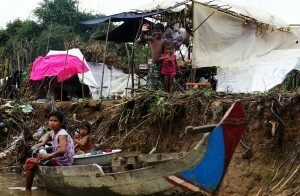 One really amazing part of the boat ride were the children on the sides of the river. They would drop whatever they were doing to bolt toward the water and wave to us. It was like waving to people on the boat was the highlight of their day. It was uplifting every time we saw their big smiles and excitement. Here is one picture of a boy and his sister waving. 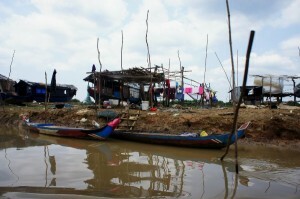 By the end of the river trip the riverside homes had turned into tents made from sticks and plastic. We arrived in Battambang and were bombarded by hotel hawkers. We picked out the best looking place and hopped in their free shuttle to the city. They tried a couple of bait and switch tactics on us, offering a $5 room at the boat, and by the time we arrived at the hotel the price had skyrocketed to $20. We kindly declined and thanked them for the free ride into the city. We found a nice hotel for $6 a night and were satisfied. Battambang was kind of a selfish trip on my part. We both heard the boat ride was a sight to see. It was a fun trip, but it took a lot out of us. 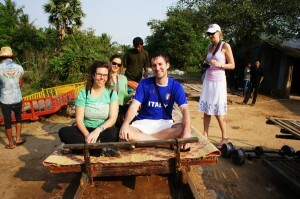 But my objective was a bamboo train ride. I heard rumors of these trains from a friend back in Chicago. Apparently when the French occupied Cambodia they built a somewhat extensive train system. Once the French left, Cambodians did not have enough money to maintain the trains or the tracks; everything went to waste. 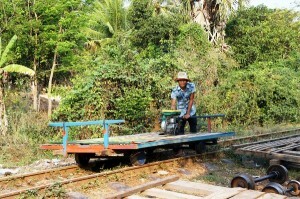 People in Battambang built trains from bamboo and used them on the tracks. Now the trains are mostly a tourist destination with rumors of the track closing all the time. We paid a couple bucks for a 20 minute ride on the tracks. I have to admit I loved it. 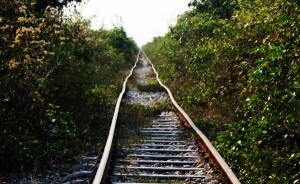 The tracks were about as straight as the river leading into Battambang. Here is a picture. The best part of the ride was when we met another bamboo train head on. Both drivers would stop their trains. They’d pick up one train, place it off the tracks, push the other train past and then reassemble the train on the other side. It was fun to watch. Here is a video of us riding on the track, some people passing by, and the train being assembled. You can see from the video it was bumpy! and when the train got up to high speeds (probably 15 mph) the train would sway back and forth. Then the driver would back off the throttle a bit. The “train” is basically a bamboo platform with a 5hp go-kart style engine on the back. It was a fun ride, but the boat ride really did us in. So we didn’t have much energy for other day trips in Battambang. We mostly just recharged our batteries.